In 1939, he began preliminary designs for the campus of Illinois Institute of Technology on the south side of Chicago. Its composition of low-slung rectangular buildings, arranged as subtly juxtaposed figures on a cleared urban site would constitute one of the most important examples of modernist urban design. In 1946, Mies would begin his work on the Farnsworth house, in which he was able, as in the Barcelona Pavilion, to pursue his ideas of structure and space, with minimal requirements of program. 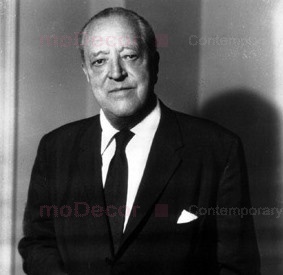 After World War II, Mies would become perhaps the most significant designers of American skyscrapers, transforming the common steel frames of such structures into subtle expressions of module, proportion and detail. Buildings such as 860-880 Lake Shore Drive in Chicago (1949-51) and the Seagram Building in New York (1958) have become canonical monuments of modernism and are studied by scholars and architects all over the world.